If you are looking for a FABULOUS, RARE, elite white male, you may want to be our partner in 3 time Champion ZAMBONI. 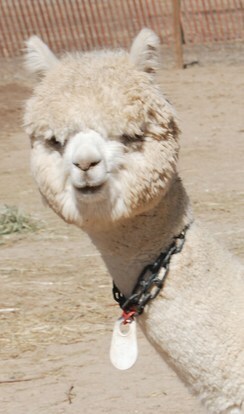 Our first venture into the elite white alpacas was our purchase of Aztec D'Ann from MacLeod's herd in Canada. D'Anna has an impeccible pedigree including D'Arcy, Coyo Destini, and her remarkable dam Snappy. Her breeding to Artic Ice (from the Snowmass herd) was a major attraction. 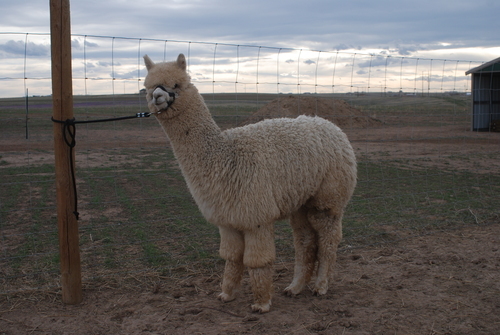 She was the high selling alpaca at the Canadian Futurity sale. Artic Ice's crias swept the Futurity show with three first places (in white classes) and the White Male Grand Champion, AND continued to be the high dollar winners for 3 years running. Zamboni was born in Canada and when he arrived with his dam D'Anna we were awed by this three week old. His blindingly bright, long, soft fleece completely covered his solid frame. He held his crimp down to his toes on his back legs and right up his neck as well as down into his belly. As we have watched him grow, we continue to see him turning into a powerful young male. His phenotype leaves nothing to be desired. At 10 months, his fleece was over 6" long and the crimp holds right out to the tip. It is consistent and fine. 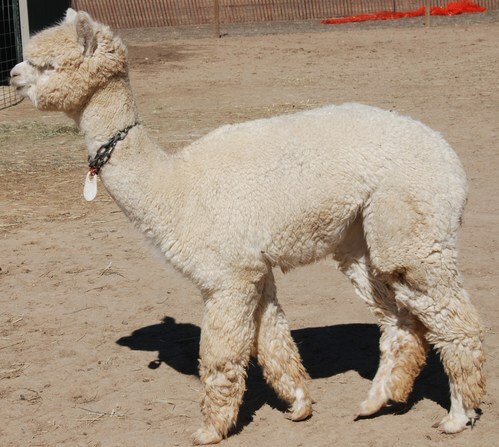 As the youngest in his class and in the group of 47 impressive white males, he took the White Male Color Champion at 9 months old at MOPACA - a Level IV show. He won over many males that ANYBODY would want in their herd with genetics from El Nino, Invincible, Legacy, Elite, Hemmingway, Snowmaster, Titanium, Archangel....and the list goes on. We were very humbled and VERY excited. We were looking to add a bred female to our herd to round out our foundation. In reviewing the fleece samples we had acquired we recalled one sample where we had not actually been able to put our hands on the alpaca as she was on her maiden breeding voyage. We made plans to revisit Sara Jane and Hugh Maclennan at Dundee Farms and take a look at Etta. We are so thankful that we did. 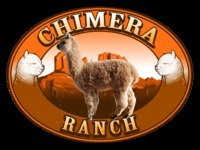 Chimera's Zoe of Zamboni is a very solid, well conformed girl with extremely long staple, great fleece fineness and organization. She is a very tall girl and stands above her cria mates of similar ages. Zoe's sire is Zamboni of Artic Ice and a great genetic line from Cperuvian Accoyo Artic 104 and RFA D'ARCY; Her Dam is Dundee's Etta of Adrenalin sired by Aztec Adrenalin. This young girl has alot of great potential and ready to begin her breeding career. You get to pick the service sire.